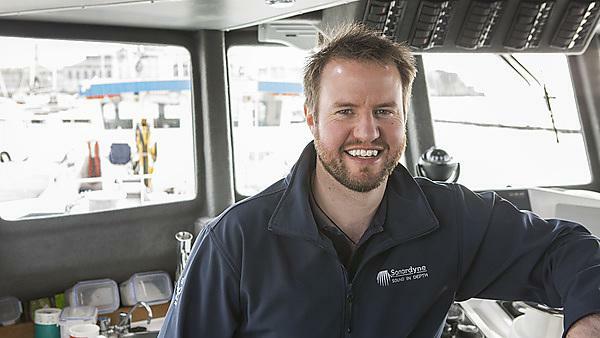 Stuart Slade now works as a trainer at Sonardyne International Ltd and has nearly a decade’s worth of experience in the ROV/oil and gas industry. After graduating, I gained a further qualification as a ROV (remotely operated vehicle) pilot/technician. After a brief spell working with ROVs offshore, I joined Fugro Survey Ltd in Aberdeen as a survey engineer. I worked for Fugro on a variety of projects in the oil and gas industry for eight years culminating in the position of survey party chief. In 2013 I joined Sonardyne as a member of the training team, teaching customers the principles of acoustic and inertial positioning and also operation of the wide array of software packages. Yes, because I was a keen diver and very interested in underwater archaeology. It was always a dream of mine to work with ROVs in the wreck discovery and salvage industry. Unfortunately, to break into such an industry, experience is required, and the quickest way to gain that type of experience is to work in the oil and gas industry. I spent almost a year in ROV operations offshore before applying to Fugro Survey Ltd in Aberdeen, where I started on a new career path in the offshore survey industry. 2003 was definitely not a good time to try and get into the ROV/oil and gas industry, as there was a slump in the oil price and the industry was in a trough. It was incredibly difficult to get any type of opportunity and my initial enthusiasm diminished. It was almost two years before the industry picked up and that is when I got my break. So my advice to anyone trying to get into this industry is be patient and ‘never give up’ as opportunities will eventually present themselves. My first helicopter ride offshore. When you fly across a particularly busy part of the North Sea and see a variety of platforms, drilling rigs, and vessels all busy at work with the vast expanse of ocean around them they look like pins in a giant pin board! In the current climate it is important to keep pressing potential employers for opportunities. The main aim would be to engrave your name on the employers mind, so that when a vacancy does arise, your name is immediately considered. Try and get exposure to the industry. With Plymouth becoming a bit of a ‘hydrographic hub’ it is an ideal place to try and gain valuable experience or mix with contacts that may be useful in the future. Plymouth was great for blending study with the huge amount of practical activities on offer in the local area: from surfing and wakeboarding through to trekking and climbing on Dartmoor. Yes, I happen to work with three at Sonardyne. My brother is also a Plymouth graduate in the same industry and I also maintain a close relationship with the Hydrography/Oceanography department at the University. Definitely yes. The oceans of the world are still relatively untouched and there is a massive range of subjects on offer at the University for you to make your way into a dynamic and exciting industry. With all this talk of professionalism, it is important to remember to enjoy your time at university. Employers much prefer a candidate who can communicate and socialise as well as show the required academic skills. Employers will not employ robots!